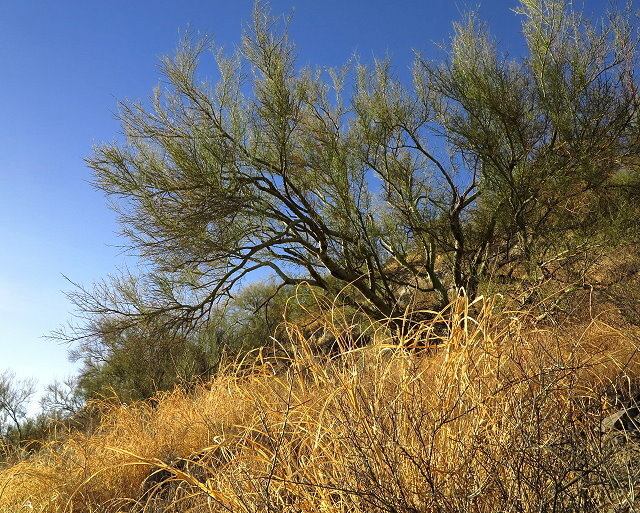 During our days at Snyder Hill BLM, west of Tucson, I go for a hike at sunrise every morning, around the hill and a couple of times to the top of the hill. 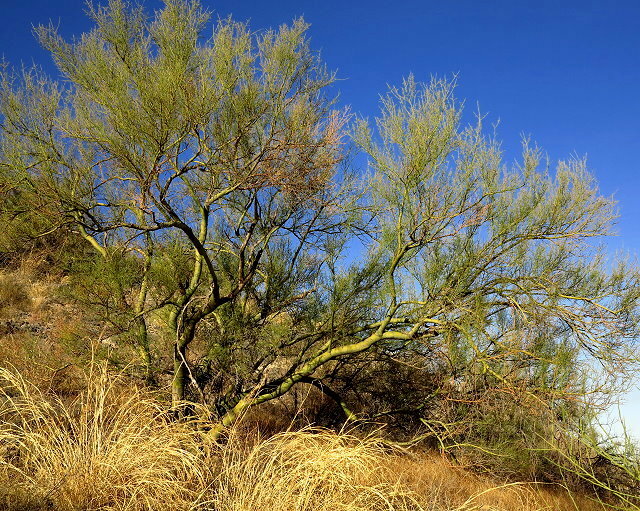 I especially enjoy seeing the Palo Verde with their chartreuse trunks and branches and the ocotillo with their sparse desert ambiance. View from the top of Snyder Hill. 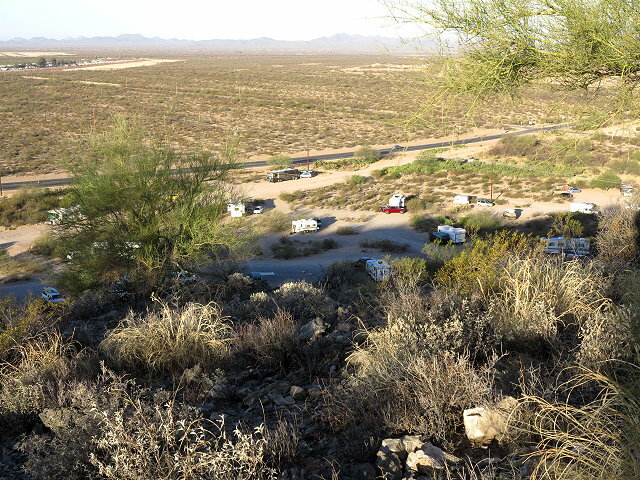 We are the camper right in the middle. One day we meet our special RV friends for breakfast at a cafe we discovered on McKinney Road. 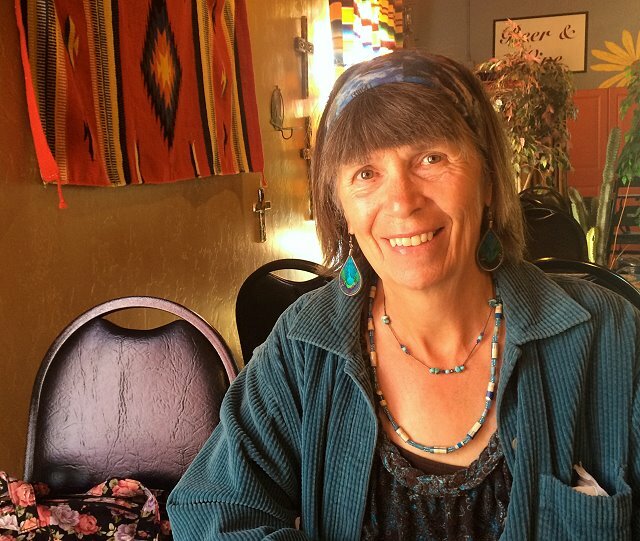 They were camped close by at Gilbert Ray campground and this cafe is on the route to their next destination. 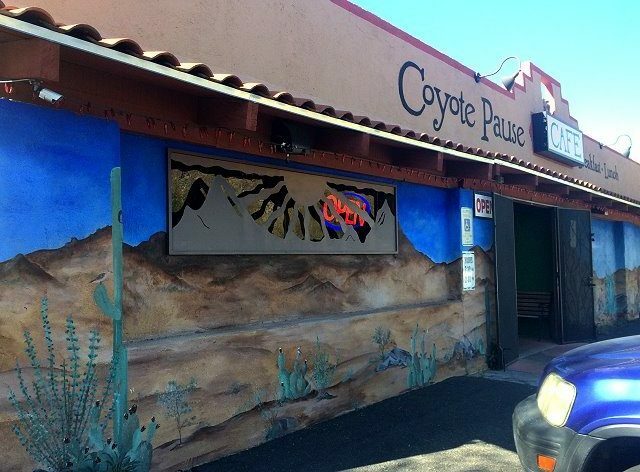 Coyote Pause is a nifty place, a lot of ambiance, good food, with a courtyard of interesting little shops and galleries. We have a good visit, getting to know each other better, and sharing stories about our travels and rock collecting adventures. A couple days later, for my birthday, I treat Clifford to breakfast at Coyote Pause. After a very good meal, we browse through the shops in the courtyard there. 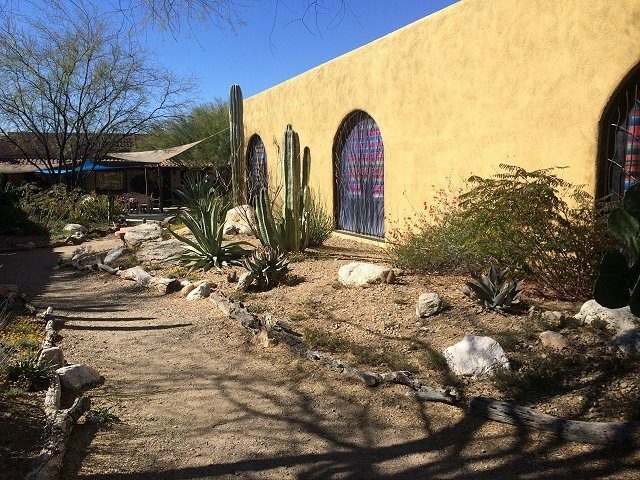 An artist’s gallery is filled with beautiful artwork of all sorts and I buy a couple of small prints depicting the beauty of the Sonoran Desert. We also explore Buffalo Trader and Clifford buys me a very colorful pair of pants, light and loose, which will be great in hot weather. 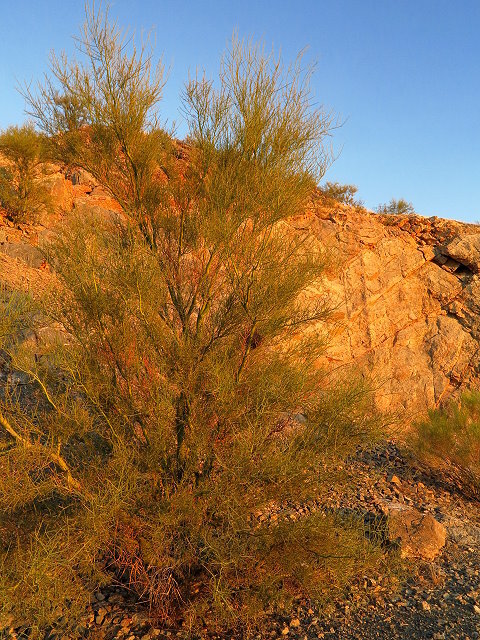 I especially enjoy the evenings when the last rays of the sun light up Snyder Hill with a warm golden glow. 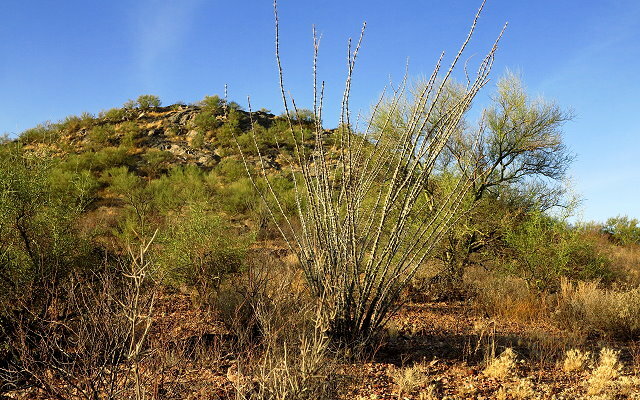 We are greatly disappointed to learn that a wildfire in the Dragoon Mountains, which was to be our next destination, will prevent our camping there. The day before we are scheduled to leave, however, we receive word that the evacuation order will be lifted in time for us to go there as planned. Hooray! I also enjoyed a great conversation with my friends at that cute little cafe! Great times! We certainly enjoyed our breakfast with you and Todd. And what a great little place to find on the spur of the moment. When we went back a few days later, we also had a great time browsing the shops there. 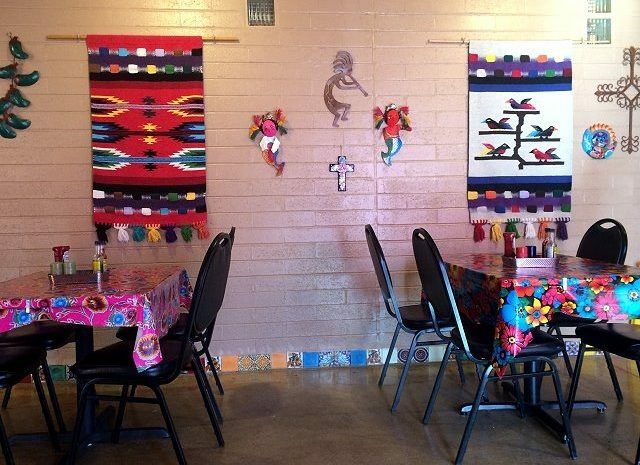 Wouldn’t it be fun to pull that off again, but one way or another, next time you are in Tucson, you could go there for breakfast and take time to visit the shops.